We are publishing a feature in Salvationist magazine to mark the 50th anniversary of Aberfan. 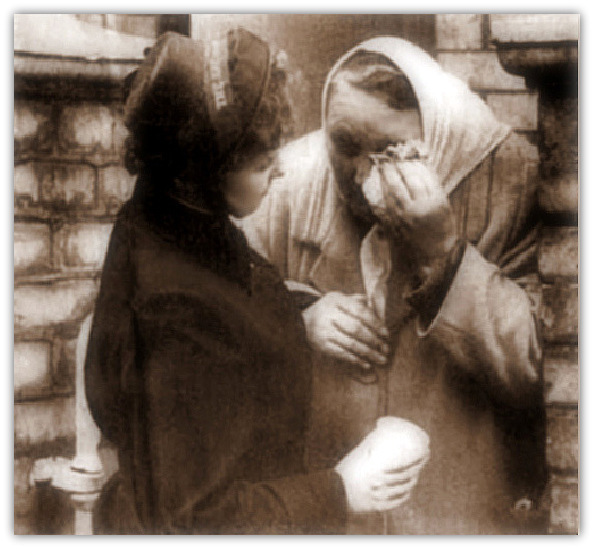 If possible we would like to publish the picture of a woman being comforted by a Salvation Army officer to go alongside a piece by the same officer re-telling her experience 50 years on. Since writing to you we have managed to track the source of the original picture which we understand to be Mirror Newspapers and we are liaising with their picture team. I've been looking at your Aberfan Disaster page and wonder where you got the second photograph from. I think that the teenager in the photograph is me, had just turned 15. We walked over the mountain from the Cynon Valley. 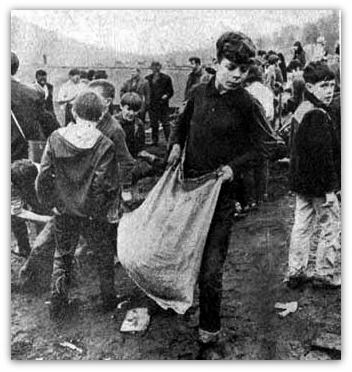 When we arrived at the site we were asked to fill bags with spoil and take them to the stream that ran down the northern edge of the site as a result of the mud slide. This photograph was taken looking down the valley with the roof of the school in the background. The reason for the bags was to stop the stream breaking it's man made banks and flowing down into the school area. By using the youngsters it would allow the skilled miners to go down and help with the (now) recovery of the bodies of the victims of the slide. Later on some of us were given yellow leggings and wellington boots to go into the stream to remove large lumps of slag to keep the stream flowing freely. I don't know how long I worked there but my abiding memory is a whistle being blown and the whole site falling silent as the miners and other rescue workers pulled the body of a victim from the slurry. Another memory is of women of the Salvation army who climbed up the slope to bring us soup and sandwiches throughout the day. In the end I was too knackered to climb back over the mountain and used the tip's tramway to cross to Merthyr Vale and hopefully hitch hike home. A police officer took sympathy on me and stopped a car and asked the driver to take me as far as possible. I remember the car was a Humber and the driver spread pages of a broadsheet newspaper over the back seats as my clothes were filthy. The driver and I never exchanged a word except for me to thank him as he dropped me off at Abercynon. At Abercynon I was picked up by a van load of miners from Penrikyber Colliery who recognised me. Ten years later I joined the Fire Brigade as a professional firefighter and worked with several 'old hands' that had attended at Aberfan in the minutes and hours following the disaster.